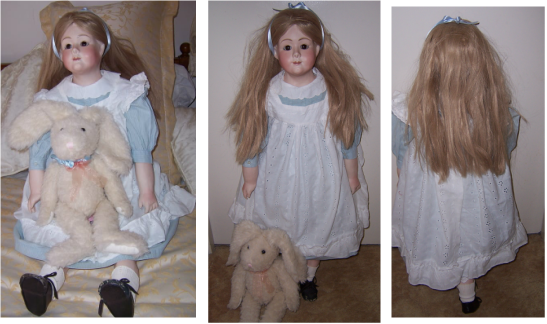 Alice is a big lovely reproduction artist doll. Alice is a lovely big doll, and displays beautifully. 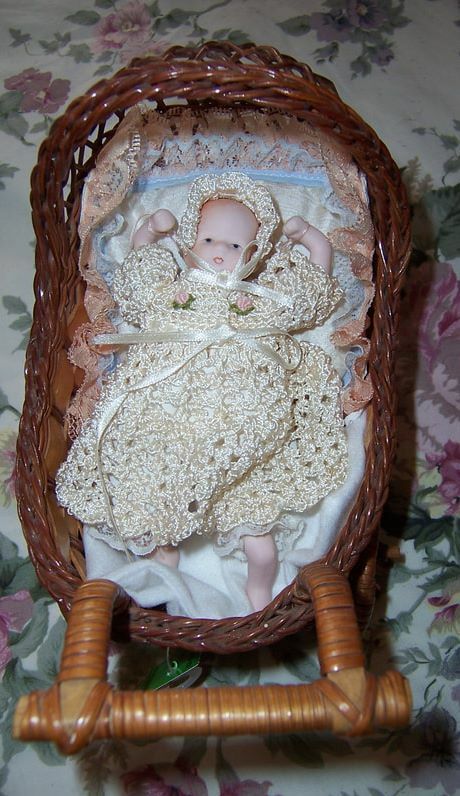 We have for sale a cute little artist OOAK porcelain baby girl doll who has no markings in a brown vintage style cane pram. She is dressed in a gorgeous silk type thread crochet dress and matching bonnet. There are two grub embroidered roses on the bodice. Underneath she has white pantaloons. She is approx 6 (16cm) long. The vintage style cane wire pram is approx 23cm long from the back of the pram hood to the end of the pram handle. It is 11cm wide from one wheel to the other wheel. It is approx 20cm high from the top of the cane hood to the bottom of the wheel. This would look great in a little girls room or just to be added to your porcelain collection.